Kasaragod, Sep 3, 2014: Bandh was observed in Kasargod district on Sept 2, following the murder of RSS Kannur district Sharirik Pramukh Manu alias Manoj (42). 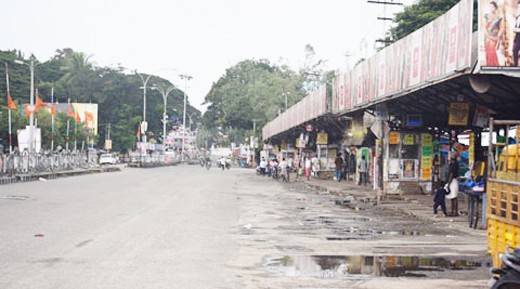 The Sangh Pariwar called the bandh in the district, excluding Kasargod and Manjeshwara taluks. The RSS and BJP activists took out a protest rally in the city. A TV cameraman was assaulted and his camera was damaged by protesters, when he was trying to record the video during the protest. A group of protesters snatched the video camera of DK Jithendran, beat him up and damaged the video cassette. The journalist was reportedly shooting the act of protesters who were engaged in damaging a poster of CITU. Arrested : CPI(M) activist Vikraman and seven other people have been arrested in connection with the murder of Manoj and a case has been registered by Thalassery police. The bandh kept many off the streets on Sept 2.